Cloud Computing, SaaS? – We have been running ‘FEEZING’ for 15 years. Many customers have a project on the desk, but not the right calculation program to work with. However, buying software is often not affordable for a single project. All available LV programs being worth 145,000 EUR can be installed on your local PC. Instead of a license check as with software purchase, individual actions are unlocked with Feezing and billed via a fee – either via the Internet or via a prepaid card, similar to a telephone card (card reader available from LV). Installing the required LV software All FEEZING-capable programs from LV are available. What is the price for a project in general? Actions subject to charges are debited from the customer account via the Internet or Internet independently of a prepaid card connected directly to the PC. If required, the amount on the Prepaid Card can be increased via the Internet or by sending a new card. The customer account can be used for an unlimited period of time. Further amounts can be requested by email. The software packages (1) and (2) each consist of a CD with the available LV programs including a starting credit of 30 EUR and telephone support for program operation for 30 days. The documentation is available online. If you have already purchased software and need special additions to this program, the basic costs are omitted. The account is to be opened with a freely selectable amount. The price per module is calculated as a percentage of the list price. The minimum amount is 1 EUR per work step. In the case of module packages, there are further module invocations during the calculation, but these are not charged separately if they are included in the basic package. Saving The first saving under a project name is charged. Temporary saving for data backup is free. If new modules are required for the calculation, these modules will be charged the first time they are saved. Loading and changing saved projects Saved projects can be loaded free of charge, but can then only be viewed and not changed. If you want to change the project, you have to pay the same fees as when starting the modules. Printing If an existing saved project is opened again, there are no costs. If the result is saved under a new project name and printed out, fees are due. Hint: Save the project as a pdf-file or docx-file (print process subject to a fee). Afterwards, these files can be printed free of charge as often as you like, e.g. for filing or distribution. The individual module packages can be updated free of charge within 12 months. Subsequent costs are described in the order form. The renewal per year takes place automatically, if not cancelled 3 months before expiration. Calculation costs arise only by the actual work steps START, SAVE and PRINT. FEEZING FLAT charges the actually used time to the quarter of an hour and not according to program starts. This allows you to plan your projects according to their scope and interrupt them at any time. The amount is to be paid in advance after receipt of invoice. One FLAT then applies to all FEEZING modules. The calculation costs of the last 6 months will be credited up to 50% with the purchase of the corresponding module package, but a maximum of 50% of the purchase price. The CD basic fee is excluded. How does billing via the Internet work? The first action with the program package, which is subject to a charge, first checks whether a prepaid card is connected. You can choose whether you want to use a prepaid card or the Internet. When feezing via the Internet, a connection to the LV server is established and account information and the current price list are obtained. Now the fee is displayed which is due for the desired action as well as the credit on the prepaid card or on the account with LV. The action will be executed as soon as you confirm the fee and it has been debited from the local account or the Prepaid Card. The process that is currently to be billed is explained in the lower field – in the example, the WTS module is to be executed. In order not to use the connection too often when feezing over the Internet, a certain amount is reserved by the account and gradually used up (local sub-account). You can freely choose the amount to be reserved – it only has to be between the amount required and your current account balance. A warning will be displayed if there is only a small amount left in your account to replenish it on time. The desired amount can be deposited on account or directly by VISA credit card. Please note the usual working hours. When you terminate the program package, the remaining balance will be credited to your account. For this you need an internet connection or a prepaid card. If you cancel this chargeback or no longer wish to establish an Internet connection, the remaining amount will be credited to your account at the next Feezing session. 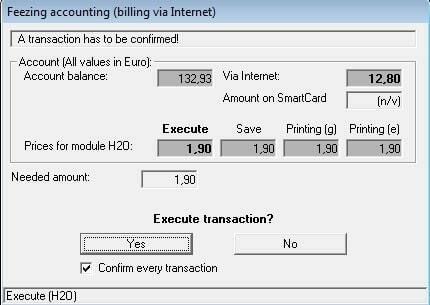 In the input mask of the program you will find a menu item “Feezing”, where you can display the price list, your account balance and a statement. Your prepaid card can also be recharged here via the Internet. Price list and account balance can be displayed directly. 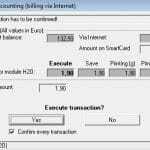 Use the ‘Refresh’ button to retrieve the account statement again via the Internet. Since you work locally, you can update the program free of charge within 12 months with Internet access directly via a button. The availability of the updates is always extended by 1 year (s. order form). Especially in the area of strength calculation, there are currently numerous incorporations due to AD 2000 and Euronorm, so that this way of updating is important. An upgrade of the software according to the VDI Heat Atlas from the 9th to the 10th edition is subject to a charge!